In her little corner of the track, Coach Ericca Frederick is carving out her own niche, working with U13 athletes. During the March 13-14 Inter Primary School Track and Field Championships, five of her athletes were crowned Division Champions in both A and B Divisions and one Victor and Victrix Ludorum. 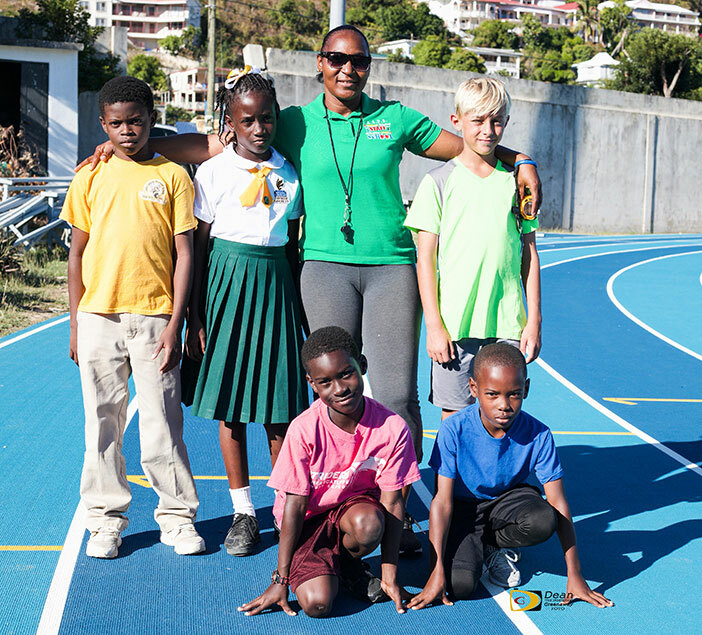 A former athlete who has been coaching since she returned from college in Jamaica in 2008, Frederick works with athletes on Fast Lane Jr. Track Club, part of the late Dag Samuels main club. It’s the most Division Champions she has ever coached in the Inter Primary Championships. Frederick said the others use the St. Georges Primary School student who won the A Division Victrix Ludorum as the Rabbit when they’re training. “They really push a lot behind of her,” Frederick noted. “Looking around with the other coaches, not many of them had U9 Boys,” she said. “He started training about two months ago.” Byrson Walters of Althea Scatliffe also won the U9 Boys A Division title. Frederick said Cedar School’s Sam Potgieter who won the U13 Boys title, was the surprise. Frederick, a Phys Ed Teacher says coaching at the youth level is important because it’s the foundation and once she gets them out training, she knows she’s working on developing them and it will help how far they get in the future. She’s always proud when they excel. She’s currently working with 10-15 in Fast Lane Jrs. and they represent Althea Scatliffe, St. Georges, Joyce Samuel, Cedar Schools and since Inter Primary, athletes from Pelican Gate have joined her stable. As a former athlete, who ran the sprints and did field events, she said she just loves the sport and also plays Volleyball and Softball. She ran from 100m to 800m and dabbled in the Discus Throw, of which she has fond memories. “One day, I came out to do the Discus Throw just to give my house some points and I actually beat the biggest girl in high school in the Discus, Suduraine Tuitt, may her soul rest in peace, I came out and broke the record that was there,” she said. Federick said she and fellow coaches would like to get the necessary equipment in developing the territory’s athletes. She said they’re trying to push hurdles and need children hurdles that can be adjusted to different heights, so that they can start training children early in hurdling technique. Frederick said some people aren’t interested in field events, but that’s where most medals have been won in Jr. competitions. Indiana freshman Rikkoi Brathwaite made his outdoor debut by winning a sprint double in the Arizona State Invitational in Tempe, Arizona. Brathwaite won the 100m in 10.45 seconds, then completed the double with a 21.34 seconds ruin in the desert. Clemson Jr. Lakeisha “Mimi” Warner ran a season’s best of one minute .37 seconds, to finish second in the North Florida Spring Break Invitational 400m Hurdles. Iowa Central sophomore Akeem Bradshaw went to winners row on the Arkansas Spring Invitational, with a Long Jump leap of 7.26m. Barton County College sophomore Adriano Gumbs with the 400m at the Emporia State Invitational with a time of 48.75 seconds. Competing in Florida, Plantation High School Sr. Chaz Fahie was sixth in the 800m in 1 minute, 57.90 seconds, becoming one of a handful of BVI high school aged athletes to break the 2:00.00 minute barrier. His time places him No 9 on the BVI All Time List.